If your cat or dog has introduced fleas into your home, there’s a good chance you also have fleas in your yard. While it’s definitely possible for your pet to pick up fleas on a trip to the park, most catch them in their own backyard. 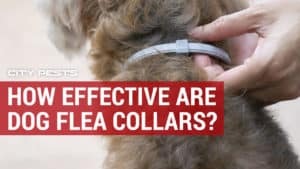 The good news is you can tackle the flea problem on your own with natural ways to get rid of fleas in your house and yard. Want know how to get rid of fleas in yard and house? Inside, wash bedding then treat non-washable items with a flea spray or flea powder. You can also use tea tree oil for fleas in house. Fleas outside your home can be treated with natural flea sprays, DE, nematodes, and preventative landscaping. Here’s an in-depth look at how to get rid of fleas in house and yard to keep your pets safe. Treating your cat or dog for fleas is just the beginning. 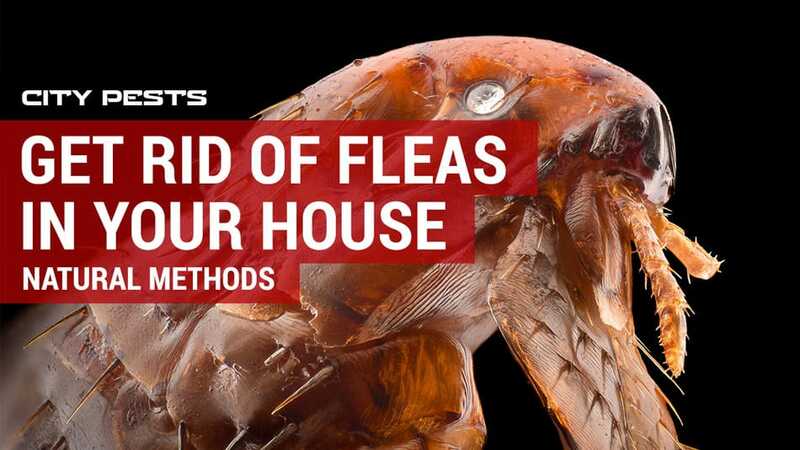 Only a fraction of the fleas will be on your pet. When adult fleas bite, they lay dozens of eggs every day that fall onto your floor, bed, or furniture and hatch into flea larvae. The larvae will spend about 10 days feasting on debris in dark areas of your home before turning into an adult flea that’s ready to hop on a new host. Here’s how to naturally get rid of fleas around the house. There’s a good chance your bed is host to fleas, larvae, and eggs if your pet has been allowed in your bedroom or you have been an unwitting host to fleas yourself. Strip your bed and place all of the bedding in a sealed plastic bag then dump it directly in your washer. Wash your bedding on the hot setting to kill adult fleas, larvae, and eggs. There are likely flea larvae and eggs on surfaces throughout your home but the floor is one of the most common places to find them. Vacuum every floor in your home carefully then vacuum upholstered furniture. Always dispose of the vacuum bag afterwards. Vacuuming is effective on hard surfaces but it won’t be enough to get all of the flea eggs and larvae that are attached to carpet fibers or hiding in crevices in your furniture. I recommend using Vet’s Best Flea and Tick Spray (Amazon). This spray is chemical-free and it’s a natural way to get rid of fleas in yard and home without risking your health. It can be applied almost anywhere, including your pet’s bed, on your dog’s coat, and around the yard. While it’s definitely not a proven strategy for combating fleas and other pests, tea tree oil still has its uses. Tea tree oil has been shown to have insect repellent and some insecticidal properties. To use tea tree oil to help stop a flea problem, mix a few drops of the oil with water and spray on surfaces in your home. I recommend using tea tree oil around your bed and on furniture. While some people recommend using tea tree oil directly on your cat or dog, do not take this risk. Tea tree oil is very toxic to cats except at very low doses. If tea tree oil is applied too concentrated to your cat’s skin, it will be absorbed into their bloodstream. When your cat grooms himself, he is likely to ingest more of the oil, potentially causing muscle tremors, drooling, vomiting, coma, and death. Flea powders can be used on your pets as well as items that can’t be washed like carpets, upholstered furniture, and your pet beds. While some flea powders only repel fleas, you should look for a powder that kills fleas on contact or quickly. Most flea powders use insecticides but there are a few that use natural ingredients to ward off fleas. A good option is Tropiclean Natural Flea & Tick Carpet Powder (Amazon) which uses essential oils like cedarwood oil, clove oil, and lemongrass oil without permethrin or pyrethrin. This powder won’t kill fleas but it will help stop them from returning. Want to know how to naturally get rid of fleas around the house? Apply diatomaceous earth, a naturally-occurring and safe powder that kills fleas by causing rapid dehydration. Use a food-grade DE powder and apply to areas that may harbor fleas such as your pet’s bedding, furniture, and carpeting. You must apply a thin but even layer of DE powder over the surface to be sure fleas and larvae will come in contact with the powder. The powder does need to be replaced if it gets disturbed or wet. Note that DE powder won’t kill flea eggs. The powder should be left in place for about 10 days to make sure all eggs have hatched. When your cat or dog brings fleas into your home, there’s a good chance they got them while playing in the yard. 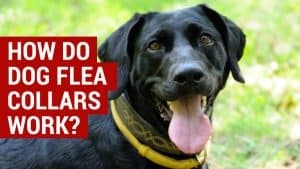 It isn’t just your home you should treat to stop a flea problem: you will also want to know how to get rid of fleas in the yard. Here’s the best way to kill fleas in yard areas without harmful chemicals. Before you start a widespread treatment for your yard, it may be a good idea to do a simple test to see if you currently have fleas in your hard. The University of California’s Statement Integrated Pest Management program recommends wearing long, white socks pulled up over your calves and walking around your yard. Pay attention to areas where your pets goes, especially dark corners and areas with long grass. Look around shaded trees and gardens, your pet’s doghouse or kennel, outdoor furniture, under the porch, and along the fenceline. Watch your legs as you walk; if you have fleas in your grass, you will spot them easily against the white socks. Whether you have confirmed the presence of fleas or you just want to make your yard inhospitable to them, the best place to start is cleaning up your yard. A simple and natural way to get rid of fleas in the yard is keeping your grass mowed, paying extra attention to patches in the corners and dark areas. Overgrown weeds and tall grass provide the perfect habitat for fleas and other pests. You should clear away any piles of debris, such as dead leaves or lumber, in remote areas of the lawn. Replace old mulch with fresh mulch to make your yard even more inhospitable to pests. You don’t need to spray pesticides in your yard to kill fleas. The best way to kill fleas in yard areas without risking harm to you or your pets is with natural ingredients. I recommend the Wondercide Natural Flea & Tick Yard Spray which uses a natural and biodegradable alternative to permethrin and pyrethroid found in most flea yard sprays. Use the attached nozzle to spray areas of your lawn where your pets like to go as well as the perimeter of your yard along the fence line and around gardens and trees. The spray should be applied twice within a week then as maintenance after every heavy rain or every 30 to 45 days. Wondercide uses cedar oil to block octopamine receptors in fleas, roaches, and other pheromone-driven insects to cause death. If you are very concerned about fleas in the yard, you may want to invest in nematode treatment. Nematodes are very small, worm-like creatures that live in the soil and feed on fleas in their larval and pupae stages. Nematodes also eat ants, flies, German cockroaches, termites, and many other pests. To use nematodes in your yard, choose a nematode pest control product designed for yard treatment. Mix with water and apply to your yard with a hose-attached sprayer. Diatomaceous earth or DE is a naturally-occurring substance made up of fossils of tiny organisms. It’s a natural insecticide that kills fleas and other pests through abrasion to strip away their protective wax coating and cause rapid dehydration and death. You can apply DE as a liquid mixed with water or dry. Diatomaceous earth flea control powder will begin working in minutes and kill fleas that come in contact with the powder within two days. 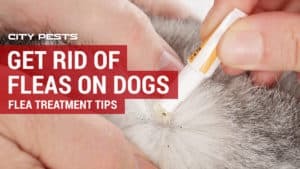 The main downside to DE when treating fleas in your hard is it needs to be applied fairly regularly as it will wash away when it rains. The good news is diatomaceous earth isn’t dangerous to humans, pets, or the environment. After exterminating adult fleas with diatomaceous earth or a natural flea spray, it’s time to water your yard thoroughly. This is the easiest way to be sure you have broken the lifecycle of fleas in the yard by removing flea eggs and larvae. Hose down rocks, around trees, garden beds, and any potential hiding spots for fleas. Water your lawn until it floods slightly. What home remedy kills fleas in the yard? There are several strategies to kill fleas outdoors without chemicals or expensive products. Diatomaceous earth can be effective along with nematodes and regular mowing. Thoroughly watering your grass until it floods can also kill and wash away flea eggs and larvae. Does Dawn dish soap kill fleas in the yard? Want to know how to get rid of fleas in the yard? Try Dawn dish soap mixed with water and sprayed over your lawn with an attached hose sprayer. Dawn dish soap will coat the fleas and kill them but only if they come in contact with the soap. Quickly banish fleas by washing bedding, vacuuming, and using a combination of flea control methods like diatomaceous earth, natural flea sprays, and flea powder. Make sure your pet is treated for fleas or the problem will continue as new eggs hatch on your pet.